On the afternoon of September 23, 2013, the miracle-working Kursk-Root Icon of the Mother of God “of the Sign” arrived in Kurk-Root Hermitage of the Nativity of the Most-Holy Mother of God. 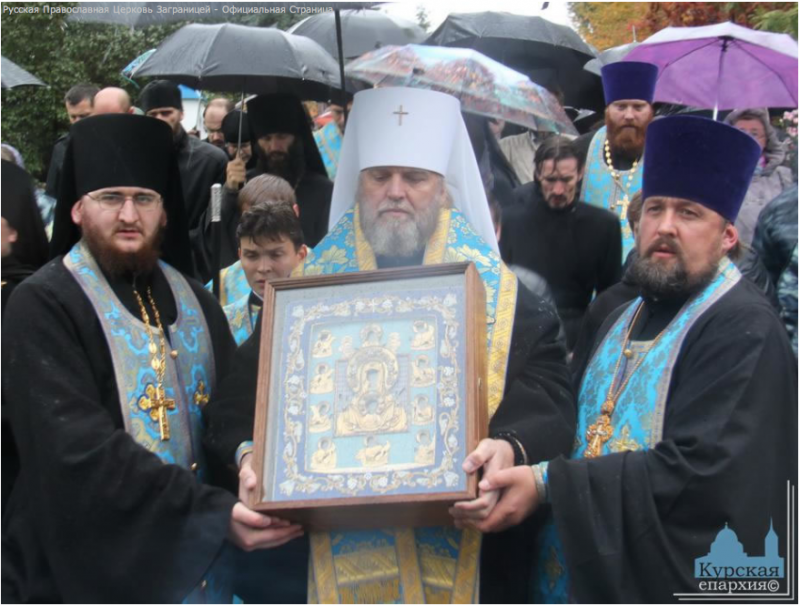 The icon was accompanied by a delegation of the Russian Orthodox Church Outside of Russia, headed by His Eminence Archbishop Mark of Berlin and Germany. His Eminence Metropolitan German of Kursk and Rylsk greeted the visitors at the monastery gates, along with His Grace Bishop Veniamin of Zheleznogorsk and Lgov; Hegumen Seraphim (Kotelnikov), Prior of Kursk-Root Hermitage; as well as the clergymen of the Kursk Metropoliate, members of the Kursk oblast administration, and Mr NI Ovcharov, Head of the Kursk Municipality. Despite the pouring rain, the holy icon led a procession of the cross as the troparion was sung and bells pealed. It was then brought into the Cathedral of the Nativity of the Mother of God and placed on an analogion in the center of the church and adorned with a wreath of flowers. he head of the Kursk Metropoliate then expressed his heartfelt thanks to the ROCOR delegation for this great joy they brought to all the Orthodox faithful of Kursk, and for the opportunity to once again venerate this holy image of the Most-Holy Mother of God, the patron and intercessor of the land of Kursk. The archpastor of Kursk noted that the icon will remain in Kursk-Root Hermitage until September 25. Molebens will be performed before it, and the church will remain open 24 hours a day. On September 25, after Divine Liturgy, the traditional procession of the cross with the Kursk-Root Icon of the Mother of God “of the Sign” will head for the city of Kursk, where it will be placed in Znamensky Cathedral until October 2.